The following is a guest post by Caz Makepeace. If you’d like to guest post on Go Backpacking, please read our submission guidelines. When most travelers plan a visit to the USA, high on their list of places to see are California, Las Vegas, Grand Canyon, New York, Chicago and Disneyworld. It is not often you hear of too many travelers planning a drive through Utah. “Utah? What's there? Isn't that the Mormon state?“…was my reply to Craig when he suggested this be part of our road trip from North Carolina across to LA. Utah was filled with surprises and turned out to be one of my favorite US states. It is what I consider to be the Creator's Art Studio. It's vibrant colors and dramatic sculptured landscapes provides an absolute feast for your visual senses; you will be blown away by its beauty. Hire a car, throw some camping gear in the back, and spend a couple of days exploring Utah's many National and State Parks. Here is a small sampling of things to do in Utah. I thought I had died and gone to fairy kingdom land when I first set eyes on Bryce Canyon. Who had been keeping this a secret? A kingdom of bright orange and pink pastel spires and towers, archways and paths leading deep into the enchanted forests of the canyon. We spent a day taking a walk along the fairy trail, deep into the canyon walls, under archways, running around spires, exploring nooks and crannies and kicking up the orange dust of the path beneath our feet. It wasn't this or the sunrise that we witnessed in peaceful solitude that made this one of the most extraordinary moments on our road trip. It was the horse ride through the canyon, led by none other than an honest-to-God real cowboy named Cash complete with studs, leather pant protectors, a cowboy hat and whiskey jokes spewing forth from a heavy western accent. 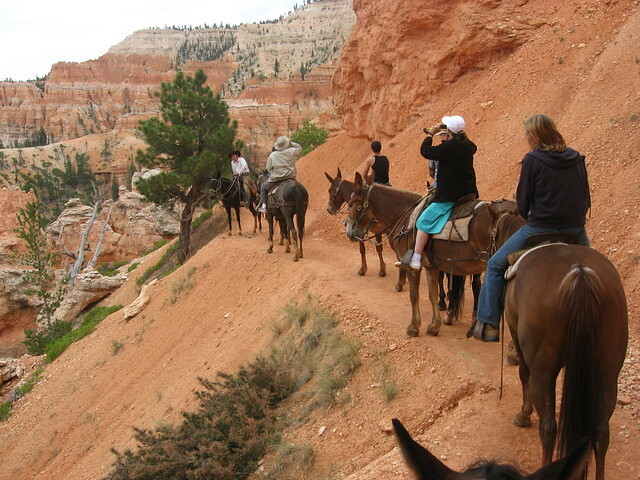 There is no more stunning way then to experience the canyon then by trotting through its narrow tunnels and steep paths on the back of a horse. A river slowly winds through the lush forested valley of Zion National Park, where pink and red sandstone cliffs and peaks beckon you to climb for amazing views. Zion is the place to come for those with an adventurous streak as some of the hiking trails here are fit only for the brave-hearted. 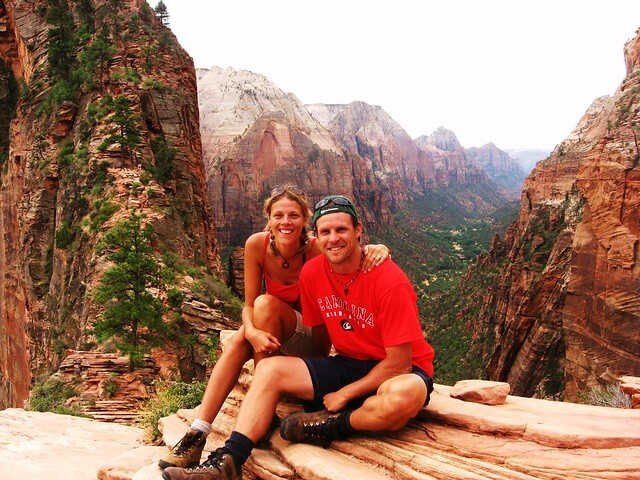 Angels Landing is one of the park's most strenuous nail-biting trails. It is not until the last half mile that you start walking along narrow cliff faces holding on to chains for balance and security. The final ascent is up a thin tall cliff on 3 foot wide paths with sheer drops down either side.I am sad to say that once we looked up at that treacherous path we decided we had reached the end of our Angels Landing road. The Narrows is Zion's most famous walk taking you through the refreshingly cool Virgin river. As the walk progresses the canyon walls begin to shrink until they reach a distance of about 20 feet apart. It is an adventurous hike that will show you a different and beautiful side to Zion, but one you do really need to be careful with. Should a sudden downpour occur, flash floods happen very quickly and with steep canyon walls on either side of you, you have no where to go but under. Arches National Park is famous for, not surprisingly, over 2000 natural sandstone arches. 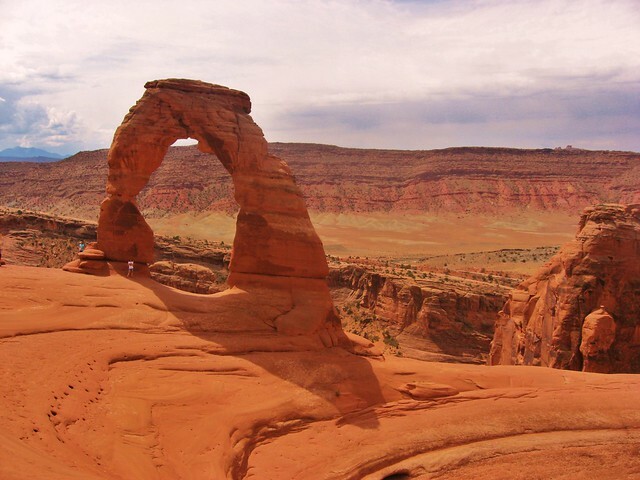 Many of the different rock formations and archways have names such as North and South Window, Devil's Garden, Courthouse Towers, Balanced Rock, the Fiery Furnace named for the way it becomes fiery when the light hits it at the right time and place. The most visited and photographed of the Arches is Delicate Arch, a lone standing symbol of the National Park. In the scorching, dry desert sun the hike can be quite challenging up a slick rock and around a narrow ledge, but it is well worth it. You cannot get a real sense of the Arch's enormous size until you stand underneath it for your obligatory photo. It is not just the gigantic red slick rock sitting on two towering pillars that makes the hike here worth it; the views of the surrounding mountains are also pretty impressive. 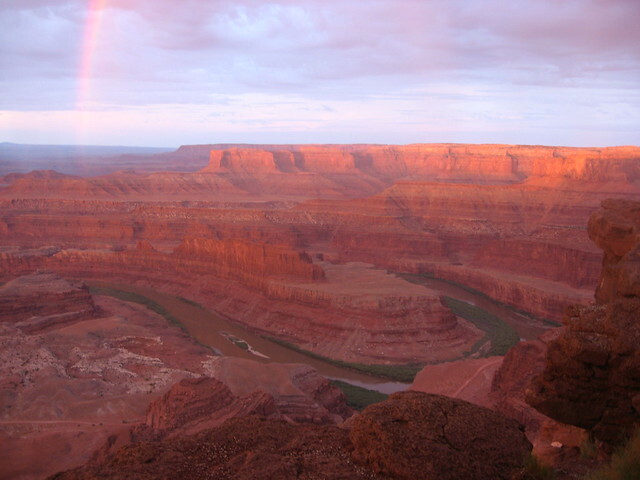 Canyonlands is not as popular or well known as the Grand Canyon, but could be considered just as spectacular. The storms that rip through here during the summer months are worth the trip alone. Whilst driving from one section of the park to another amidst a terrifying storm, a lightning bolt hit the ground only meters from our car and absolutely sizzled the air around us. A frightening display of Mother Nature, but one that was pretty awesome to see. The Colorado River and its tributaries have divided the park into three separate areas, each having its own distinctive character and opportunity for exploration. There are plenty of hiking and bike trails to take advantage of, as well as areas to raft on the river. Be warned that traveling between the areas of the park can take several hours due to the indirect roads that join them. 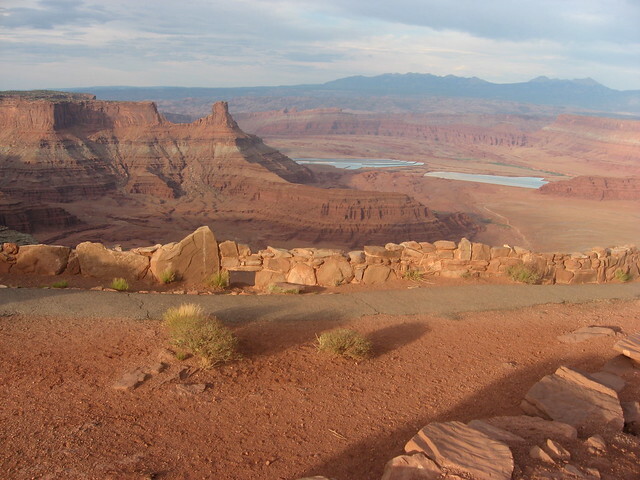 Dead Horse Point State Park, not far from Canyonlands, is the place to visit for an absolutely stunning vista of Canyonlands. Grab a couple of beers and sit and watch as the sun sets, casting a soft glow over the sculpted pinnacles and buttes, carved by the winding Colorado River below. Kiss your beer and send cheers to the Universe for allowing you the opportunity to witness such a magical panoramic. We camped here on the evening of July 4. Whilst most Americans were watching fireworks and eating hot dogs we were marveling at the absolute stunning beauty of Utah. After all the hard work hiking and horse riding, it might be time to take in the stunning Utah landscape from the comfy seat of your air-conditioned car. Scenic Highway 12 is the place for you to go. You may at some stage throughout the drive think that you have been abducted by aliens and transported to another planet, so surreal is the landscape in its lunar unearthly appearance. The colors of the boulders and bizarre sculptured rock turns from red, to orange, to gray, to white, to black and then a whole rainbow mixture of everything. This is the place where the Creator did most of his experimentation with color as he splashed it from one end of the studio to the other. At times I had to close my eyes as the visual onslaught was a little too much and I needed my brain to take a break from all that absorption. About the Author: Living and travelling around the wold since '97 solo, as a couple and now with a 3 year old, Caz Makepeace believes life is all about the memories and travels to create more of them. She shares her travel stories, tips and inspirations at y travel blog and through her fanpage community.